Fawn, first image. Tahquamenon Falls State Park. When a potentially fleeting photo opportunity arises, get the shot first. Then take the time to improve the shot. 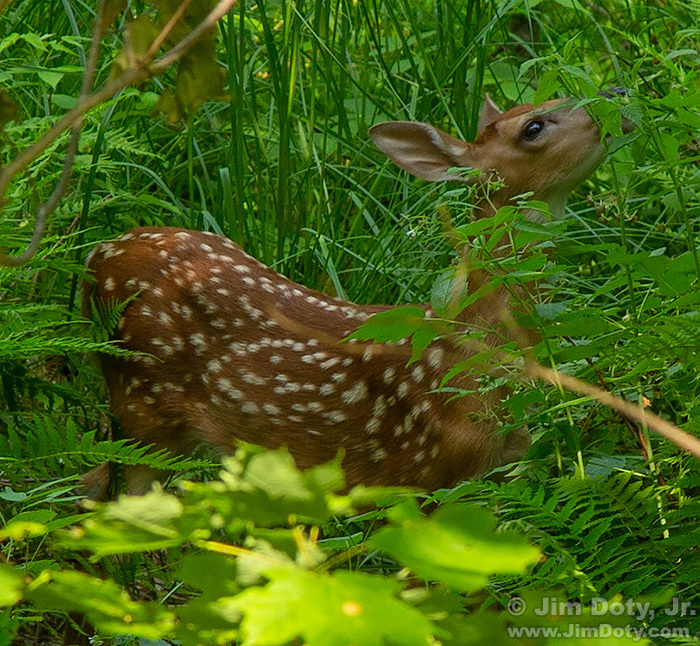 This fawn was not far from a busy path in Tahquemenon Falls State Park. At any moment it could bolt. So I grabbed a two quick hand held shots with my 24-105mm lens just to make sure I had something in the can. Fawn, first shot heavily cropped. This is cropped from the same photo. At least it is something. It is too small to print, but it works for the web. Fawn, second image. Tahquamenon Falls State Park. I opened my backpack and got out a long zoom lens and put everything on a tripod for the best possible image quality. I ended up with several nice, printable images. The light level was quite low back in the trees and bushes so I set the ISO to 1000 to get a reasonable shutter speed and aperture. I adjusted the white balance for the shade. This image would be better if there wasn’t an out-of-focus foreground branch right below the fawn’s face but there was no place I could move to get rid of all the foreground distractions. Photographers make the most of whatever they are given. 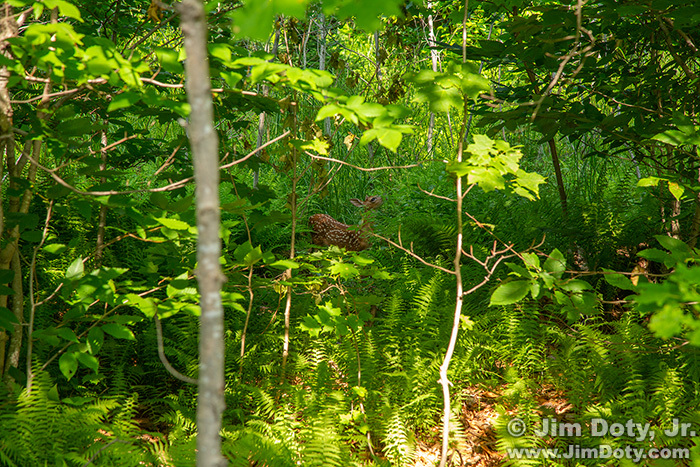 The only reason I have any images of the fawn is the sharp eyed photographer on the left who first spotted the fawn. The fawn was far enough off the path no one else had noticed it. People began to gather to watch and take pictures. The fawn eventually decided to move on. If I am in a place where I expect to see wildlife (like Rocky Mountain National Park), I have two cameras out and ready to go, one with the 24-105mm lens and the other with a telephoto lens. That way I am ready for anything. 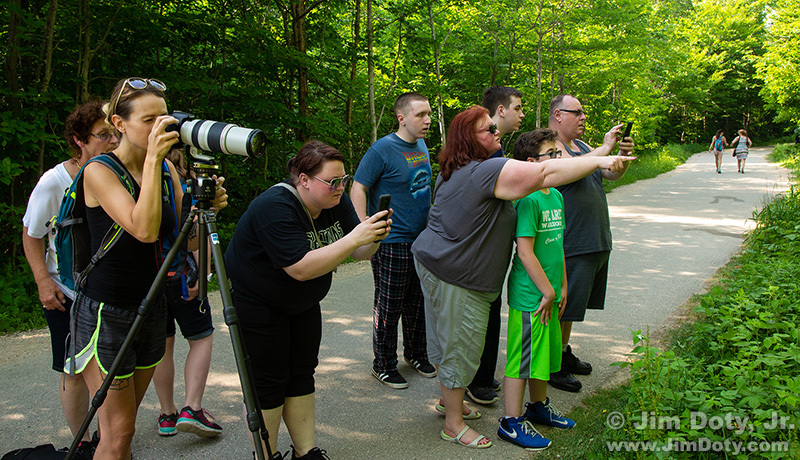 I usually don’t expect to see wildlife at Tahquamenon Falls due to all the people around. As it turns out, the fawn stayed around long enough for me to change lenses and get the shot. A big thanks to Brittany for spotting the fawn. I’ve watched a lot of missed photo opportunities because the photographer was changing lenses or messing with a tripod. Get the shot first. Then work on ways to improve it. 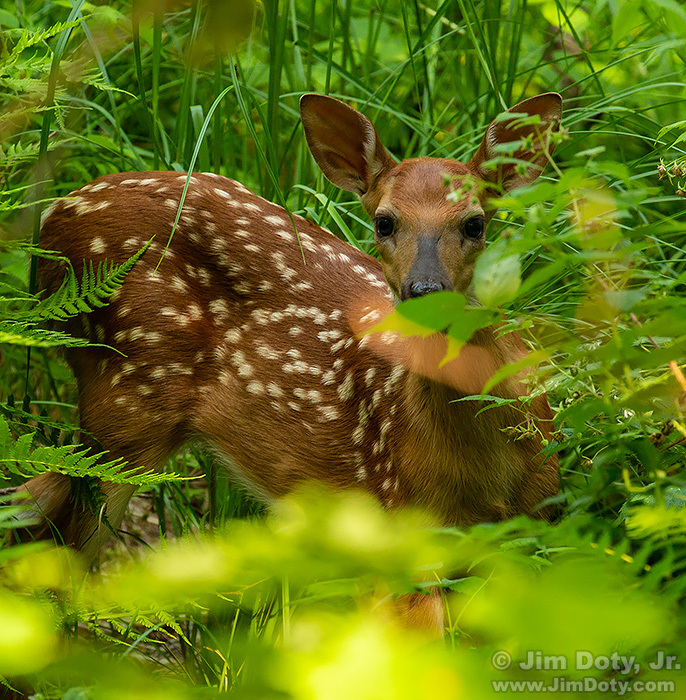 First fawn image: Canon 5D Mark III, Canon 24-105mm lens at 105mm. f6.3, 1/100 sec, ISO 400. Second fawn image: Canon 5D Mark III, Canon 100-400mm lens at 400mm. f8, 1/160 sec, ISO 1000. This entry was posted in General, Photo Locations, Photographs, Using Equipment by Jim. Bookmark the permalink.